Daniel Pink is a cultural observer who writes about academic research in ways that are accessible, interesting, and frequently surprising. He reminds me of Malcolm Gladwell, a writer for The New Yorker who has written a number of popular books that draw extensively on academic research—Blink, Outliers, and The Tipping Point. It raises the question of why academics depend on others to translate their research, but that is a topic for another day. 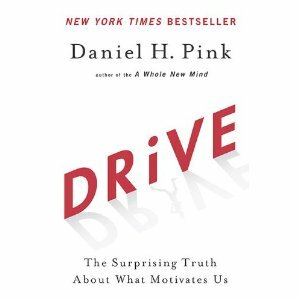 Daniel Pink’s newest book is Drive, which describes what science tells us about motivation. The central theme of his book is “the mismatch between what science knows and what business does.” The findings that Pink describes apply to all kinds of organizations, including the School of Government. Here in a nutshell is what Pink says about motivation. People are not “motivated solely or even mainly by external incentives.” That includes money. Contingent rewards and punishments (so-called “if-then” rewards and punishments) can be effective in limited situations—for certain kinds of rule-based routine tasks—but they can “dampen motivation and diminish performance” for other kinds of tasks that require greater creativity. Notwithstanding all kinds of scientific research to support that conclusion, most organizations continue to focus on controlling the behavior of their employees with carrots and sticks. Those ingredients largely exist for faculty members at the School, or at least it seems that way to me. Faculty members have lots of autonomy in carrying out the mission of the School, and they have the opportunity for mastery in their work over the course of a career. Do we offer enough of the same opportunities for our professional staff? Do we give them adequate autonomy in carrying out their work—a lot of which requires finding creative solutions for many different kinds of administrative problems? Do we give them the opportunity to develop mastery in their work? I’ve not read Pink’s new book, but I am familiar with considerable research that supports the conclusions you cite about intrinsic motivation as important to creative, productive, happy workers. We explore these issues in the courses I teach for our MPA students. We are blessed here at the School of Government with a culture that attracts and supports people who seek to take responsibility for doing good work (autonomy), continuously learning to do their work better (mastery), and working for the greater well-being of the people of North Carolina (a higher good). My experience is that faculty and staff here, nearly without exception, share those values. That is how we are able to recruit and retain such creative and productive colleagues. In my experience, our SOG culture is not supportive of faculty alone, nor is it only faculty members who seek to be responsible experts dedicated to making our state a better place for all its people. Our SPA and EPA professionals also typically share those personal motivating values. That is why this is such a productive and pleasing place to work. As an organization, we need to be vigilant in sustaining that culture, finding ways to strengthen and reinforce it. Recruitment and orientation of new employees are critical parts of that support. Organization research suggests that, while organization may encourage or discourage the flowering of internal motivators, much of an adult’s internal motivation is already well established before the person enters a new organization. Acculturation can help new hires make sense of the organization, but the predispositions and values a person brings to the organization, also shape how that person interprets the culture of the new organization. We’ve been quite successful overall in bringing together a group of people who want to work together to find ways to serve a purpose greater than ourselves. As someone with extensive work experience in other organizations (including other faculties), I find our culture exceptionally supportive of people with these intrinsic motivations. We need to find ways to enhance and extend our supportive work culture as we continue to recruit new colleagues who share our internal motivations for autonomy, mastery, and purpose in our work. Mike I’ve never read any of Daniel Pink’s books or writings. However, I believe you have presented a valid point regarding motivation & purpose in the workplace. Also, I believe you have “hit the nail on the head.” I look forward to reviewing Mr. Pink’s book. Do we have his book in the SOG Library? Discussing Duke’s win last night definitely does not motivate me. The Tobin Project is an alliance of the nation’s leading academics united by a belief in the power of ideas and a shared commitment to using ideas to improve the lives of their fellow citizens. Modeled after earlier efforts to link academics and lawmakers, such as John F. Kennedy’s Academic Advisory Group, the Tobin Project seeks to influence public debate by reaching both outward to connect with the policy community and inward to shape debate within the academic community.